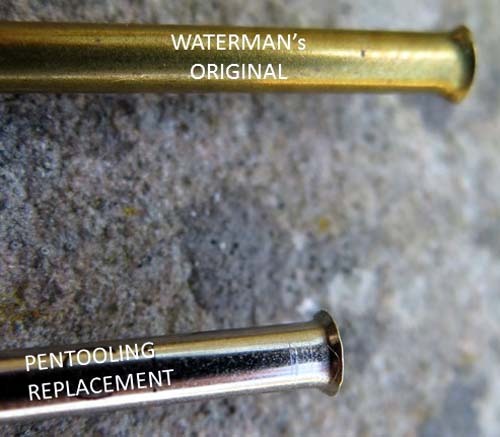 ITEM #H2OPRESSURE: WATERMAN's PRESSURE BARS. Sorry, I can't tell you which length which pen uses; I haven't found that page from the service manual yet. If you have, please send it. And I have no lever boxes. To buy please email Pentooling. Be sure and provide a shipping address including city and state/province so we can calculate shipping costs and get your order to you.INTERNATIONAL BUYERS PLEASE INCLUDE YOUR PHONE NUMBER SO YOUR POSTAL SERVICE CAN NOTIFY YOU WHEN REQUIRED. ITEM #5713: WATERMAN PATRICIAN BARREL IN BLACK. Solid with strong imprint. ITEM #5712: WATERMAN PATRICIAN BARREL IN ONYX. Faded but solid & uniform color. Strong imprint. 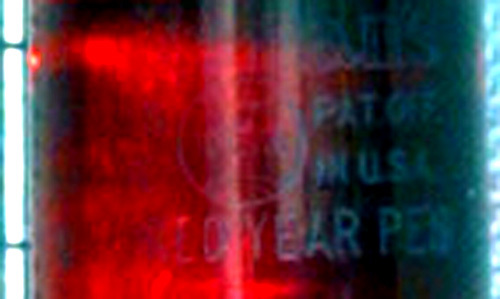 Has persnalization on the barrel inspired by Jack J. Dunn. 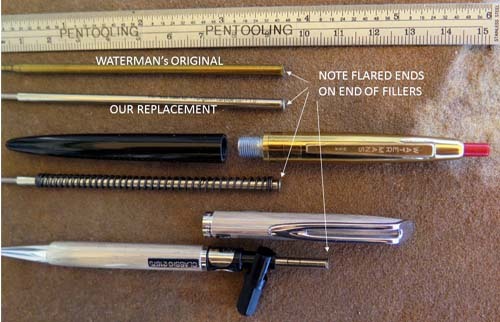 ITEM #CF REFILL: BALLPOINT REFILLS FOR OLDER AND LATER CFs AND OTHER WATERMAN's BALLPOINTS. I had a batch of those funky old refills with the flared back ends made. These fit BOTH of the Waterman's CF ballpoint releases from the 50s and the ones from the 80s. 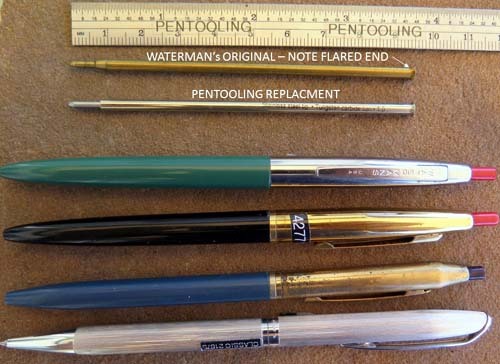 They fit most of the other older Waterman's ballpoints shown below, the ones with the long monster springs. And they fit the newer 80s release CFs with the fold-over rube goldberg holders for the fillers (one of these pens is shown at the bottom of the first photo). They fit a lot of other early Waterman's ballpoints that aren't shown below; If yours has a flared back end on the refill and the monster spring, these will fit.The second photo shows typical Waterman's older non-CF ballpoints that these fit as well as a later "Classic" CF released in the 80s. The last photo shows the dimensions of the original filler that these replace. Black ink w/ a tungsten carbide ball. We also made a different version of these that fits Cartier Must, Trinity, Vendome, Cougar, and Panther. Ask about those if interested. To buy please email Pentooling. Be sure and provide a shipping address so a shipping cost can be calculated. ITEM #CF AERO: WATERMAN CF CONVERTORS. Hard to find convertors that fit the original 50's vintage and the 80's vintage ("CLASSIC") Waterman's CF pens. Section end is .236" dia. (5.99 mm); back end is .260" dia. (6.60 mm), length = 2.377" (60.42mm). There is a rubber conical seal/seat built into the front of the convertor. These are Squeeze type, not piston. ITEM #4880: WATERMAN's #58 WOODGRAIN BARREL. Has a good box, lever, & pressure bar with the lever being nickel plated. Everything, including the threaded end is in excellent condition. Largest diameter (above the lever) = .572", length = 3.874". The "58" on the end of the barrel is good and crisp. Please take a look at the photo and decide on your own definition of the color/pattern; there seems to be a lack of agreement on which is which, Woodgrain or Ripple. In any event, it does not have the word "RIPPLE" contained in the imprint as pens with the later pattern did. To buy please email Pentooling. Be sure and provide a shipping address so a shipping cost can be calculated. International buyers please provide phone number for shipping paper. ITEM #CF PARTS: COMMON CF FRONT END PARTS. If you're looking for any of these CF front end parts, drop me an email. I usually have most off them. I don't have any nibs. I also have limited number of parts for the CF front ends that use the fatter feed. ITEM #CFCARTRIDGES: WATERMAN's CF CARTIDGES, UNUSED, OPENED, AND CLEANED ULTRASONICALLY. Use your Waterman CF pens again! These cartridges are no longer made. These clean, empty CF cartridges are intended for re-use after filling with a syringe (available on the "Files, Brushes, and Odd Tools" page on the "Tools" menu). Waterman's still makes a convertor for CFs, but they want $32 + shipping (I don't sell CF convertors). I took Ancient Old Stock (AOS) unused cartridges, poked them with the section of a CF pen which they would normally be used with, flushed the old coagulated gunky ink residue out of them and then ultrasonically cleaned them. They still seal fine when inserted into a Waterman's CF or Classic (new issue CF model from the 80s)pen. Also, please be aware that we carry Waterman Aerometric style CF convertors (listed above). To buy please email Pentooling. Be sure and provide a shipping address so the shipping cost can be calculated. ITEM #4421: NEW OLD STOCK 1940 GREEN TRANSLUCENT OVERSIZED 100 YEAR BARREL. This was either a repair part or factory surplus, as it has never been used. It came with the inventory of an old repair shop I bought. Be advised that it is in impeccable condition but it has no band. It is complete, except for the band, with a new lever box and pressure bar included. To buy please email Pentooling. Be sure and provide a shipping address so you can be given a shipping quote. ITEM #CF PARTS and PENS: NEED CF PARTS? SEND ME AN EMAIL. Sorry, there are no whole front ends left. ITEM #4356: REFILLS FOR WATERMAN'S CHECKING PENCIL, #28 (RED). I've never seen the pencil these fit in, but if you have one, here are some refills for it, along with a cool box. Diameter = .22" (7/32", 5.6mm). ITEM #H2O CLNDR: WATERMAN'S NICKEL PLATED FOUNTAIN PEN DESK BASE CALLENDAR. Scalvaged from a broken marble Watermn's desk base, this piece is very solid and in great functional, clean shape. To buy please email Pentooling. Be sure and provide a shipping address that the US Postal Service will accept. If you're outside the US, please provide your phone number for the shipping paper. ITEM #REDCAP: SMOOTH TRANSLUCENT RED 100 YEAR PEN CAP. No cracks, gold filled trim. .559" max diameter, .438" inner diameter @ opening, 2.096" total length.